Soon, drones might be doing more than just delivering packages. They may be talking to us. Currently, companies left and right are developing a number of applications for drones in our daily lives. Perhaps most notable are the ones that can deliver goods right to our doorsteps. It might seem rather commonplace that these drones may one day bring your dinner, groceries, or mail packages to you, but how it will give it to you is another matter. To that end, Google has something rather interesting in the works. 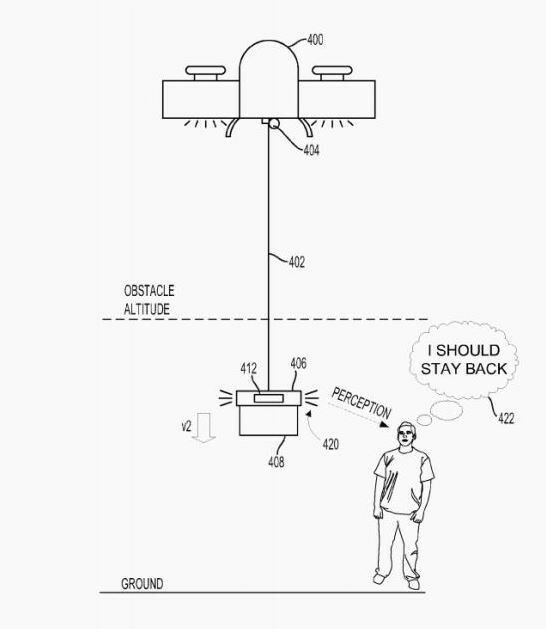 On April 25, Google was awarded a patent for a delivery drone that’s automated, and can drop off packages without the need to land by using a tether cable. However, that is just the beginning. The highlight of this drone (if it goes into production) is that it can talk to people, tell them to take a step back away from a package being tethered down, and notify when a delivery is complete. It also makes use of warning lights that change color (red, yellow, or green) apart from the talking capability. Who knows, perhaps Google’s vision of humans and robots interacting isn’t too far away.